In the Brut, Rosè and Saten versions to rediscover unique flavours and landscapes. Vineyards that slope down towards the valley, in the Calino woods, the Sebino Lake at the bottom, that turns into the sky, grapes that become the highest quality wine. This is a new product that is born out of a great farming tradition, a slow and constant labour that transforms the bunches from simple fruit into an indelible memory. The flavours of the D.O.C.G. 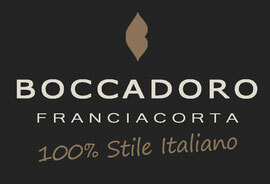 Franciacorta BOCCADORO takes advantage the primary element, it enhances its quality and conjures up unique sensations. The Brut, with its fresh fragrance, ideal for any time, whether the main event or as an aperitif; the Rosè, smooth and complex, with its delicate and distinguishable colouring, and last but not least, Saten, full bodied and velvety, which contains a mysterious combination of complexity and simplicity. You can discover the instinct, the reason and the perfect blend of these because quality is not just for the connoisseur.